If you’re like us and you don’t want the time you waste to, um, go to waste, consider visiting www.FreeRice.com. FreeRice.com is an on-line vocabulary game which donates your winnings to the less fortunate. Each time you identify the correct definition to a word from a list of four options, you feed someone ten grains of rice. 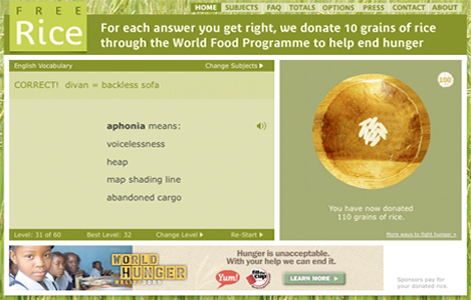 The grains add up and when you’re done the site donates the equivalent amount of real rice to a starving family through the United Nations World Food Program. You play, they eat. And because sponsors pay for the banner ads it doesn’t cost you a thing. We like the concept in principle but wish the site would offer 100 grains of rice for each correct answer and not just ten. Realistically, we don’t think people are going to go to the website daily and spend the time it will take to get the 110 correct answers necessary to fill the bowl of 1,100 grains (which is the equivalent of one full serving of rice). Eleven correct answers we’d aim for every day, not 110. That said, if you’re one that feels guilty for the time you spend on daily crosswords or Sudoku, consider increasing your vocabulary and help end hunger at the same time. And while you’re at it, we need your help. What the heck does ‘aphonia’ mean anyway? !